IMPORTANCE Identifying a procedure to address lower eyelid retraction (LER) in the presence of an orbicularis deficit is a useful tool for aesthetic and reconstructive eyelid surgery. OBJECTIVE To describe and evaluate a surgical technique consisting of a closed canthal suspension and true lower eyelid retractor recession to address LER in the setting of orbicularis weakness. DESIGN, SETTING, AND PARTICIPANTS A retrospective medical record review of patients who underwent the minimally invasive, orbicularis-sparing, lower eyelid recession from January 1, 2010, to October 1, 2012, by one of us (G.G.M.) in an ophthalmic plastic surgical practice. We included 29 patients with reduced orbicularis strength and LER resulting from eyelid paresis related to facial nerve disease, surgical trauma (after blepharoplasty), involutional change, or idiopathic causes. INTERVENTIONS Surgical intervention consisting of closed canthal suspension and lower eyelid retractor recession. MAIN OUTCOMES AND MEASURES Surgical results, complications, and patient satisfaction. RESULTS The 29 patients included 18 women and 11 men. The mean patient age was 52 (range, 6-72) years; mean follow-up, 11 (range, 6-21) months; and mean preoperative orbicularis strength, 2.7 (on a scale of 0-4, where 0 indicates no function and 4, normal function). The causes of orbicularis weakness included eyelid paresis related to facial nerve disease (11 patients), surgical trauma (13 patients), involutional change (4 patients), and an isolated idiopathic finding (1 patient). In 12 patients, the eyelid retraction was unilateral; in 17, bilateral. A small tarsorrhaphy was added to the surgery in 6 patients with facial nerve disease. The mean eyelid elevation after surgery was 1.80 mm, with only minor complications. Patient and surgeon satisfaction were high. CONCLUSIONS AND RELEVANCE Recent publications have demonstrated the utility of closed canthal suspension and true lower eyelid retractor recession as separate procedures. In the setting of LER with reduced orbicularis strength and/or tone, the publications can be combined to recess the lower eyelid without disturbing the already compromised lower orbicularis muscle (minimally invasive, orbicularis-sparing, lower eyelid recession). The combination technique is safe and effective and yields excellent results. JAMA Facial Plast Surg. 2014;16(2):140-146. doi:10.1001/jamafacial.2013.2401 Published online January 16, 2014. When planning surgery for lower eyelid retraction (LER), identification of the etiologic factors that underlie the eyelid malposition is critical to attaining a successful surgical outcome. Depending on findings, numerous publications have been described to elevate and support the lower eyelid, including various forms of canthal suspension, lower eyelid retractor lysis, the use of posterior lamellar spacer grafts,1-6 midface elevation,7,8 and skin grafting.9,10 Often, these publications have involved transcutaneous incisions, open canthal access, and lower orbicularis manipulation, all of which can lead to a postoperative reduction in orbicularis function. Although these procedures can provide excellent static elevation of the eyelid, they can also have a negative effect on surgical results by violating the orbicularis muscle and reducing its dynamic function. Although orbicularis strength has been described as a factor important to maintaining lower eyelid position in the LER literature,11 surprisingly little, if any, attention has focused on the importance of preserving orbicularis function in the setting of LER, especially when orbicularis function is compromised preoperatively. A closed canthal suspension12-14 with true transconjunctival lower eyelid retractor recession15 provides a means of lower eyelid recession without undue lower orbicularis muscle trauma. We have termed this combined technique the minimally invasive, orbicularis-sparing (MIOS), lower eyelid recession. The procedure can be used in cases of noncicatricial LER with reduced orbicularis strength, whether related to facial nerve injury, surgical trauma, involutional change, or another abnormality. The procedure is best suited for facial surgeons with experience/interest in eyelid surgery and has been consistent and effective in providing a mean 1.80 mm of lower eyelid elevation in the appropriately selected patient. Herein we present our experience with the procedure and elaborate on the surgical technique and results. We conducted a retrospective review of themedical records of patients who underwent the MIOS lower eyelid recession performed by one of us (G.G.M.) during a 3-year period (January 1, 2010, through October 1, 2012). All patients were treated at the private practice of the surgeon, and all surgical procedures were performed at an outpatient surgical center separate from the hospital (institution) at which the surgeon has privileges. No patients or patient records included in this report are associated with this institution; therefore, institutional review board approval was not required. Informed consent was obtained for each procedure. The review adhered to the standards of the Declaration of Helsinki and was compliant with the Health Insurance Portability and Accountability Act. All patients received a thorough preoperative examination, including an assessment of orbicularis muscle strength. Muscle strength was measured subjectively on a graded scale ranging from 0 to 4 (0 indicates no function; 4, normal function). In this scale, the numerical value assigned is based on the ability of the examiner to pry open the patient’s eyelids during forceful closure by the patient. A score of 4 (normal function) was given when the examiner could not open the patient’s eyelids. Scores of 3 and 2 correspond to slightly and moderately reduced function, respectively. A score of 1 would reflect significantly reduced function, and a score of 0 would reflect no orbicularis function because the patient’s eyelids did not move at all with attempted closure (flaccid paralysis). Patients returned at regular-interval postoperative follow-up visits (1 week; 1, 3, and 6 months; and 1 year) whenever possible. The margin reflex distance 2, an indicator of the amountof lower eyelid retraction present, was measured in millimeters as the distance fromthe corneal light reflex to the lower eyelid margin by the same examiner (G.G.M.) on initial presentation and at the last follow-up (at least 6 months). The amount of lower eyelid elevation (correction in millimeters) was defined by subtracting the final postoperative from the initial preoperative margin reflex distance 2. All procedures were performed under local, monitored anesthesia or general anesthesia, depending on patient preference. An incision in the crease of the temporal upper eyelid is demarcated. The temporal upper eyelid is infiltrated subcutaneously and to the periosteum of the canthus with 3 mL of 1% lidocaine hydrochloride and 1:100:000 epinephrine (Xylocaine). The lower eyelid is also infiltrated transconjunctivally with 2 mL of the same anesthetic mixture. The lower eyelid retractors are addressed first. A transconjunctival incision is made with scissors (Wescott; Acme Shear Company) or an electrocautery unit just below the tarsus for the full width of the eyelid. The conjunctiva and fused layer of the orbital septum and lower eyelid retractor are engaged with a 4-0 silk traction suture that is secured to the head drape. Blunt dissection with a cotton-tipped applicator further exposes the lower eyelid retractor complex. A buttonhole is made through this layer superiorly. The conjunctiva below the lower eyelid retractors is identified (Figure 1A). Blunt dissection with spreading of the tips of the scissors creates the subretractor plane (Figure 1B). The lower eyelid retractors are then cut at the superior edge of the wound from the nasal to the temporal aspects (Figure 1C). Blunt and sharp dissection are used as needed to free the retractors from the conjunctiva (Figure 1D). If the conjunctiva is inadvertently buttonholed, it is easily repaired with a buried 6-0 plain gut suture. The lateral horn of the retractors is identified by its firm attachment to the lateral orbital rim (similar to the lateral horn of the levator aponeurosis in the upper eyelid). This attachment is lysed to allow the retractors to free completely. No dissection between the orbicularis muscle and the orbital septum is performed. The conjunctiva is then reapproximated to the inferior tarsus with 3 buried, interrupted 6-0 plain-gut sutures. The MIOS procedure combines retractor recession and closed canthal suspension. A, Forceps pointing to the conjunctiva over the cornea (blue) and sclera (white), with the arrow directed at elevated retractors. B, Scissors undermining the retractors. C, Scissors incising the retractors. D, Forceps elevating the recessed retractors. E, Internal lysis of the canthal tendon through incision in the temporal eyelid crease. F, The canthus engaged with the suture and secured to the periosteum at the inner orbital rim. The upper eyelid is attended next, where an incision is made with a scalpel blade through skin and muscle at the previously demarcated temporal crease. Dissection proceeds below the orbicularis muscle and above the periosteum to the lateral orbital rim until the lateral canthal tendon is identified. The tendon has a firm attachment to the orbital rim and is easily strummed with the tips of the scissors (Figure 1E). This maneuver is simplified by engaging and elevating the proximal lower eyelid near the canthus with a forceps. The scissors is then directed from the incision in the temporal crease toward the canthal tendon, which is now put on stretch (“tented up”). The tendon is then incised, and adynamic release of the canthus occurs. When an internal cantholysis is not desired, the tendon is identified and scored but not cut. We believe that, at a minimum, scoring the tendon is needed to create a raw edge for readherence of the canthus. One arm of a double-armed 5-0 polydioxanone suture on an RB-1 needle is then passed through the canthal commissure or the terminal tarsus ,depending on the degree of eyelid suspension and elevation desired. The second arm of the suture is passed through the same entry point at the canthus (Figure 1F). This procedure is performed as previously described.12 The suture is then passed through the periosteum at the lateral orbital rim, at or about the Whitnall tubercle, and the suture is tied. The orbicularis muscle and skin of the crease incision are then reapproximated with remnants of the 6-0 plaingut suture used previously. Twenty-nine patients (46 eyes) were included in the review (18 women and 11 men). Mean age was 52 (range, 6-72) years; mean follow-up, 11 (range, 6-21) months. The mean orbicularis strength as subjectively measured by one of us (G.G.M.) preoperatively was 2.7. This measurement was unchanged after surgery in all patients. Only patients with scores of 2 or greater underwent surgery because the utility of this procedure was uncertain when orbicularis weakness was more severe. In 12 patients, the eyelid retraction was unilateral (11 patients with facial paresis [Figure 2E-H] and 1 who underwent blepharoplasty). 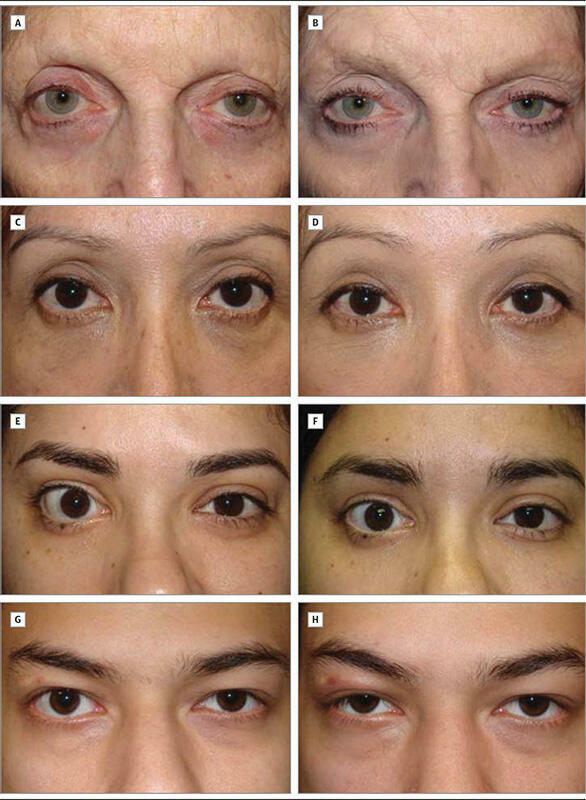 In 17 patients, the eyelid retraction was bilateral and related to previous blepharoplasty (12 patients) (Figure 2A-D), involutional change (4 patients), and idiopathic diplegia of the lower eyelids (1 patient). Six of the 11 patients with facial / eyelid paresis (55%) underwent a small adjunctive permanent lateral tarsorrhaphy (3 mm) to shorten the horizontally elongated palpebral fissure and add support to the lower eyelid (Figure 2E-H). All 29 patients had an improved postoperative eyelid position, with a mean correction of 1.80 mm. In the facial paralysis patient subgroup, the mean correction was 1.95 mm, whereas in all other patients it was 1.75 mm (Table). No patients had wound-healing issues, motility disturbance, diplopia, persistent chemosis, infection, or excess pain or tenderness. No patient demonstrated difficulty reading or inferior visual field limitation. Finally, 3 patients noted “bumps” in the location of the canthal fixation suture. In each case, this issue resolved within 3 months without intervention. All patients were very satisfied with their surgical outcomes. Preoperative photographs are given on the left; postoperative photographs from the same patients, on the right. A-D, Two patients who developed lower eyelid retraction bilaterally after lower blepharoplasty. Neither patient has more than a minor cicatricial component. E and F, A young woman with right lower eyelid retraction related to Bell palsy. She declined upper eyelid weight implant before surgery. G and H, A young man with right lower eyelid retraction related to traumatic (surgical) facial nerve paresis. A slight overcorrection in his eyelid height postoperatively did not bother him. No aesthetic deficit was created by the addition of the tarsorrhaphy in the last 2 patients. Lower eyelid retraction is a complex eyelid malposition with varied causes and anatomic features16 that make correction of eyelid position challenging. We find that in the particular patient population who manifest LER and reduced orbicularis strength, preserving postoperative dynamic lower eyelid muscular support makes attaining satisfactory outcomes more predictable. Reports of lower eyelid retractor recession from the conjunctiva with release of the lateral horn of the retractors15 and closed canthal suspension12-14 have been described separately. These individual procedures have resulted in excellent outcomes with few complications. Unique to these procedures is the ability to recess the lower eyelid retractor complex completely (in the former) and to suspend the lateral cantus (in the latter) without undue trauma to the sphincteric action of the lower limb of the orbicularis oculi muscle. We herein present our experience with combining these previously described procedures for patients with LER and a weakened orbicularis muscle, which we term the MIOS lower eyelid recession. The procedure is referred to as minimally invasive because it is performed through a small incision of the temporal upper eyelid crease and a hidden transconjunctival incision. The procedure is effective because it recesses, elevates, and suspends the lower eyelid through access points that leave the lower eyelid orbicularis muscle relatively undisturbed. The lower eyelid retractor complex consists of the capsulopalpebral fascia and the inferior tarsal muscle,17 the lower eyelid analogue of the Müller muscle in the upper eyelid. Release of the lower eyelid retractors to recess the lower eyelid is not a new concept. In 1990, Holds et al18 reported on aminimal incision “en glove” retractor lysis of the lower eyelid. The retractors were cut blindly through an open canthal incision without violating the skin or the conjunctiva. In 2011, Chang et al11 reintroduced the concept (similar technique) as part of a more significant eyelid recession that included the addition of a soft-tissue matrix (Alloderm; LifeCell) or dermis fat spacer graft fed through the eyelid with a Keith needle from the lateral canthus to the medial canthus to enhance outcome by volumetric expansion. Although the retractors are incised during these publications, they are not individually freed (recessed) from the conjunctiva or surrounding structural attachments, such as the dense attachment of the lateral horn of the retractors. In the series by Holds et al,18 a minimal 1 mm of eyelid elevation was achieved in each patient; in the report by Chang et al,11 a mean eyelid elevation of 1.5 mm (patients receiving soft-tissue matrix grafts) or 1.0 mm (patients receiving dermal fat grafts) was achieved. The addition of a spacer graft allowed true recession of the retractors from the tarsus in the series by Chang et al, whereas secondary intent healing may have prevented this process in the report by Holds et al. In 2011, Norris and Malhotra15 described a true lower eyelid retractor recession with dissection and release of the retractors from the conjunctiva as part of a more complex eyelid recession technique. The lateral horn of the retractors is specifically identified and cut. These investigators also free the orbital septum from the orbicularis muscle, thus performing a complete septum/retractor recession. They add orbitomalar ligament release and anterior lamellar advancement to improve outcome. A mean lower eyelid recession of 1.4 mm was attained. In our present series, the retractor recession and lateral horn lysis is similar to those described by Norris and Malhotra.15 However, Norris and Malhotra performed the retractor. Two reports12,13 have described variations of a closed canthal suspension to reinforce the lower eyelid in the setting of functional deficit and aesthetic surgery. The procedure is referred to as a closed canthal suspension because the canthus is not incised. In both series, excellent results with few complications were reported. The benefits of this technique include avoiding a canthal incision and/or scar, maintaining the commissure and canthal angle, reducing canthal dystopia, and most importantly, creating less disruption of the very complex anatomy of the lateral canthus.14 To this list we add preserving the integrity of the lower limb of the orbicularis oculi muscle. By accessing the canthal tendon through an incision in the crease of the upper eyelid, the local (upper eyelid) orbicularis is buttonholed. However, dissection to the canthal tendon is above the periosteum and below the orbicularis muscle, leaving the orbicularis at the canthus and the lower eyelid intact. This approach provides a level of orbicularis protection that is critical in patients with premorbid orbicularis deficit. Some investigators19-21 question traditional thought on what segments of the lower orbicularis are important in eyelid support and suggest that infraciliary incisions do not violate lower orbicularis innervation and function. We observe otherwise and believe strongly that muscle violation/trauma, in the absence of inadvertent denervation, may affect its contractile state. We measured preoperative orbicularis strength as described in the Methods section. We realize that this measurement is subjective, but it was performed by the same author (G.G.M.) on each patient, ensuring consistency of this important measurement. All patients undergoing surgery had scores of 2.0, 2.5, or 3.0. Patients who presented with greater degrees of orbicularis deficit were arbitrarily excluded from study because we believed that more aggressive procedures (open canthal surgery, eyelid shortening, midface-lift, etc) may be needed to address their eyelid retraction adequately. Patients with normal orbicularis strengthwere excluded because they did not meet the inclusion criteria of orbicularis deficit. Patients who had undergone previous blepharoplasty and were included in the study were those who demonstrated minimal eyelid scarring (cicatrix) with a moderate to significant component of orbicularis weakness. Patients with more significant eyelid tether would be better suited for more aggressive surgical rehabilitation. The MIOS lower eyelid recession yielded a mean correction (lower eyelid recession) of 1.80 mm at 11 months’ follow-up in the entire patient population. In the 11 patients with eyelid paresis (associated with cranial nerve VII abnormalities), the overall mean correction was 1.95 mm. In the 6 patients in this group with adjunctive tarsorrhaphy, the mean correction was 2.40 mm; in the 5 patients without tarsorrhaphy, it was 1.40 mm. In the remaining 18 patients (without facial nerve disease), the mean correction was 1.75 mm (Table). This result was surprising because our preconceived notion was that eyelids with facial nerve disease would yield poorer results. However, these eyelids did not have previous surgery (or scarring), the eyelids had orbicularis function scores of 2 to 3 (more severe cases were excluded), and 55% had the added small (3-mm) permanent lateral tarsorrhaphy to symmetrize the elongated horizontal palpebral fissure and add support to the lower eyelid. The tarsorrhaphy added a mean 1.00 mm of eyelid elevation in these patients (2.40 vs 1.40 mm correction), significantly improving surgical outcomes. However, even the 5 patients with facial/eyelid paresis who did not have a tarsorrhaphy added had excellent lower eyelid elevation of 1.40 mm, which is difficult to achieve in this patient population. In each case, the tarsorrhaphy was not noted to be an aesthetic disturbance to the patient or surgeon (Figure 2E-H). We found no cases of prolonged healing, persistent chemosis, infection, or excess pain or tenderness. No reduced eyelid depression with infraduction, inferior visual field limitation on downgaze, or problems reading (all potentially related to retractor release) occurred. Even with significant inferior dissection of the lower eyelid retractors, no postoperative motility disturbance was noted in any patient. This possibility was a prestudy concern because the origin of the retractors is closely associatedwith the inferior rectus muscle. In addition, less correction and more regression were noted in patients with negative-vector eyelids and more significant post blepharoplasty volume depletion. Although the authors did not study these variables in depth, the trend was present and makes sense given our understanding of the role of volume and eyelid support.22 Finally, 3 patients noted bumps in the location of the canthal fixation suture. In each case, this problem resolved within 3 months without intervention. The results of this study suggest that preservation of orbicularis function is likely an important variable in attaining better outcomes in eyelid recession surgery. We included only patients with noncicatricial eyelid retraction who primarily manifested reduced orbicularis strength. In thisway, other confounding variables that can lead to retraction were eliminated. When middle or anterior lamellar deficiency is present, appropriate eyelid repositioning requires more involved publications. Spacer grafts, skin grafts, and midface-lifts all have roles in specific cases. In addition, orbicularis manipulation and open canthal surgery may be needed to attain a successful result in these cases. However, our experience suggests that, whenever possible, the surgeon should avoid maneuvers that may reduce orbicularis function. No standard solution to eyelid retraction surgery exists. The appropriate procedures must be selected based on specific preoperative findings to attain the best outcome. Fortunately, facial/eyelid surgeons continue to think creatively and devise ways to improve results and minimize complications of standard surgical procedures. The combination of 2 such innovations, closed canthal suspension and true lower eyelid retractor recession, have led to the MIOS lower eyelid recession, which combines and adapts ideas from others.12,13,15 The technique shows promise as a safe and effective means of recessing retracted lower eyelids with orbicularis weakness in a consistent, reproducible, and reliable manner. Malhotra R, Selva D. Free tarsus autogenous graft struts for lower eyelid elevation. Ophthal Plast Reconstr Surg. 2005;21(2):117-122. Baylis HI, Perman KI, Fett DR, Sutcliffe RT. Autogenous auricular cartilage grafting for lower eyelid retraction. Ophthal Plast Reconstr Surg. 1985;1(1):23-27. Kersten RC, Kulwin DR, Levartovsky S, Tiradellis H, Tse DT. Management of lower-lid retraction with hard-palate mucosa grafting. Arch Ophthalmol. 1990;108(9):1339-1343. Brock WD, BeardenW, Tann T III, Long JA. Autogenous dermis skin grafts in lower eyelid reconstruction. Ophthal Plast Reconstr Surg. 2003;19(5):394-397. Patel V, Osborne S, Morley AM, Malhotra R. The use of pericranial flaps for reconstruction and elevation of the lower eyelid. Orbit. 2010;29(1):1-6. Mourits MP, Koornneef L. Lid lengthening by sclera interposition for eyelid retraction in Graves’ ophthalmopathy. Br J Ophthalmol. 1991;75(6):344-347. Patel MP, Shapiro MD, Spinelli HM. Combined hard palate spacer graft, midface suspension, and lateral canthoplasty for lower eyelid retraction: a tripartite approach. Plast Reconstr Surg. 2005;115(7):2105-2117. Shorr N, Fallor MK. “Madame Butterfly” procedure: combined cheek and lateral canthal suspension procedure for post-blepharoplasty, “round eye,” and lower eyelid retraction. Ophthal Plast Reconstr Surg. 1985;1(4):229-235. Hurwitz JJ, Archer KF, Gruss JS. Treatment of severe lower eyelid retraction with scleral and free skin grafts and bipedicle orbicularis flap. Ophthalmic Surg. 1990;21(3):167-172. Putterman AM. Lower eyelid full-thickness vertical lengthening. Am J Ophthalmol. 1979;88(1):113-118. Chang HS, Lee D, Taban M, Douglas RS, Goldberg RA. “En-glove” lysis of lower eyelid retractors with AlloDerm and dermis-fat grafts in lower eyelid retraction surgery. Ophthal Plast Reconstr Surg. 2011;27(2):137-141. Taban M, Nakra T, Hwang C, et al. Aesthetic lateral canthoplasty. Ophthal Plast Reconstr Surg. 2010;26(3):190-194.